Filed to: Lynchburg?Filed to: Lynchburg? 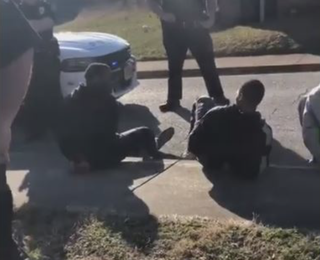 Virginia University of Lynchburg students shown handcuffed as police officers stand over them. Four Virginia University of Lynchburg ...Wait, there is an actual place called Lynchburg and black people are there? This story is over; the police did whatever the black kids said they did. Me: My name is Kunta. Genetta: Lynchburg isn’t named after lynchings although I see where you’re going with this, it’s named after John Lynch who started the first ferry service in the state. Me: Yeah, well, who was John Lynch named after? Four football playing college students at the Virginia University of Lynchburg (which is totally not named after lynchings but I wouldn’t blame you for thinking that) were stopped by police because they exceeded the number of blacks allowed to be in one car in the town of Lynchburg. Because of the influx of broken tail lights and the association of broken tail lights leading to murders, the officers reportedly had his gun drawn and asked all of the kids to get out of the car. Video of the incident was initially posted to Facebook but has mysteriously disappeared. “It was kind of alarming to watch, just to see that,” VUL football coach, Bobby Rome, who watched the incident unfold, told the news station. In the video, viewed by the news station, the officer explains that he’s pulled his gun because he smelled marijuana. The students say the car was searched twice and police didn’t find any drugs, and in the end, they only received a ticket for the broken light. The Lynchburg Police Department hasn’t released the officer’s names because they don’t want anyone to know who they are. They did note that they are investigating the incident, which includes withholding the officers’ name. The university wants to hold a meeting with students to prevent the incident from happening again, but it seems like they should be talking to the police.